Looking for a gift or reward that's going to impress? Rhyll Haven Gift Certificates are a perfect way to treat someone special to a truly memorable experience. Choose from two night stays in beautiful Rhyll Haven Cottage; one or two night stays in our luxury suites Mangrove or Sandbar; or one or two night stays in our cosy loft apartments Pelican and Black Swan. Breakfast is included. 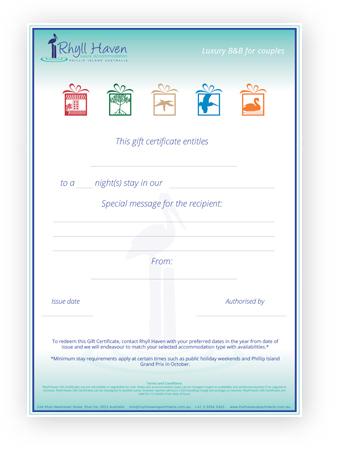 Once your payment is processed, Rhyll Haven Gift Certificates can be downloaded as a PDF for you to print at home, or we can print for you on high quality presentation grade paper and post to you or the lucky recipient. *Minimum stay requirements apply at certain times such as public holiday weekends and Phillip Island Grand Prix. Check our website terms and conditions. Gift Certificates are valid for one year from date of issue. Recommended method. 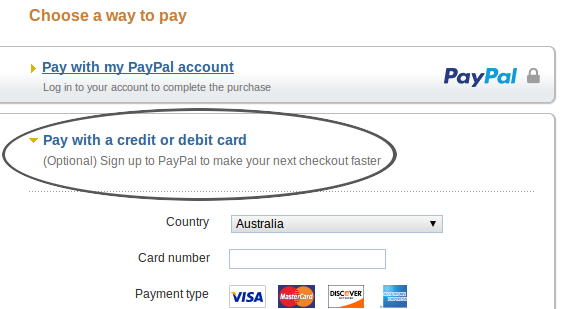 Pay quickly and securely from your credit card, debit card or bank account without disclosing the account numbers. Avoid fees. Contact us on 03 5956 9463 and we'll send bank deposit details. Rhyll Haven Gift Certificates are not refundable or negotiable for cash. Dates and accommodation types may be changed subject to availability and additional payment if an upgrade is involved. eg from loft to suite or suite to cottage. Rhyll Haven Gift Certificates can be reassigned to another party, however reprints will incur a $20 handling charge and postage as required. Rhyll Haven Gift Certificates are valid for 12 months from date of issue. Minimum stay requirements apply at certain times such as public holiday weekends and Phillip Island Grand Prix. Check our website terms and conditions.